In interior decorating, there is a concept of the 60/30/10 rule – that is percentages of different colours to use in a decorating scheme. 60% + 30% + 10 % proportion formula is considered to be a timeless decorating rule that can be used to mix different colours in a balanced way in a room. Just like a room, you can apply the same concept to your outfits to create harmony and balance. And it’s a really useful formula to apply when thinking about adding your value contrast or colour contrast to an outfit (not sure of your colour and value contrast – find out what yours is with my 3 Step Process here). 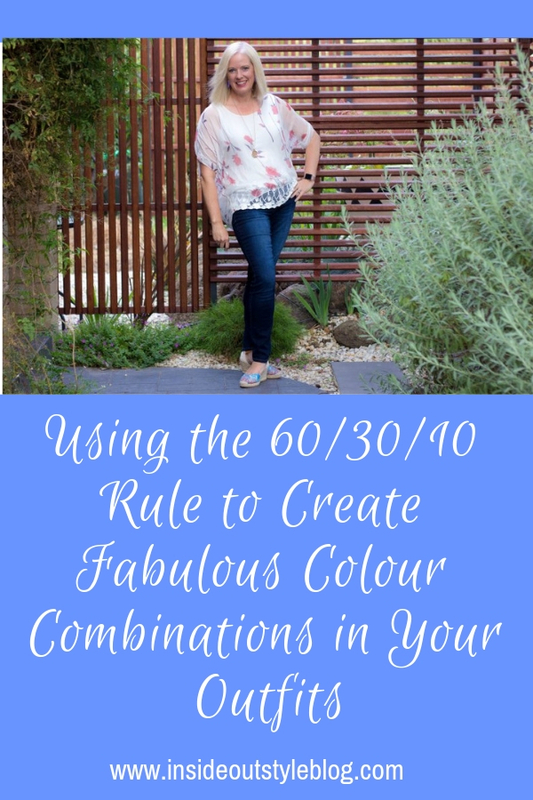 I’m frequently asked how to add multiple colours to an outfit, without looking like a clown (or just too colourful and out there), this is a simple way to do it. 60% of your outfit is the main colour (or neutral, depending on which way you rock). I’ve found that whatever you choose this 60% colour to be, it’s best to be in a similar value to your hair, as this is your ideal value and should form the largest proportion of your outfit (but there is a way to break this which I’ll show you a little later in this post). 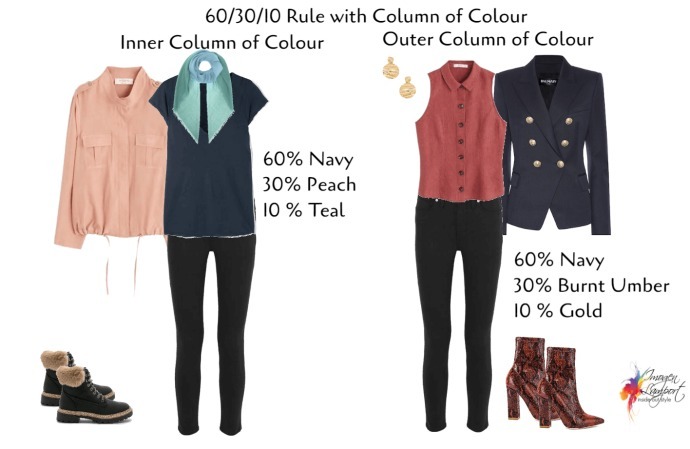 30% of your outfit is the secondary colour or neutral. Choose a colour that again relates to your contrast levels. It may be to create your ideal colour contrast, or your ideal value contrast (and if you’d like my professional opinion on your ideal contrast levels, you can get this as part of my 7 Steps to Style program). It may be your top or a jacket/topper, depending on how you’re putting your outfit together. 10% of your outfits is an accent colour. Use this (if you haven’t already done this in your outfit) to create your ideal value or colour contrast, or to repeat that contrast and reinforce it. This is most likely to come in accessories – scarves, necklaces, belts, shoes, hats etc. The more similar your colours read (they don’t have to be exactly the same colour) they will be counted as the same colour. It can be done with neutrals, neutrals plus colours, or colours alone. Here are examples in mixes of neutral plus 2 colours. You can use this rule whilst maintaining a column of colour (which many like for its elongating effect). You can use an inner column or an outer column. 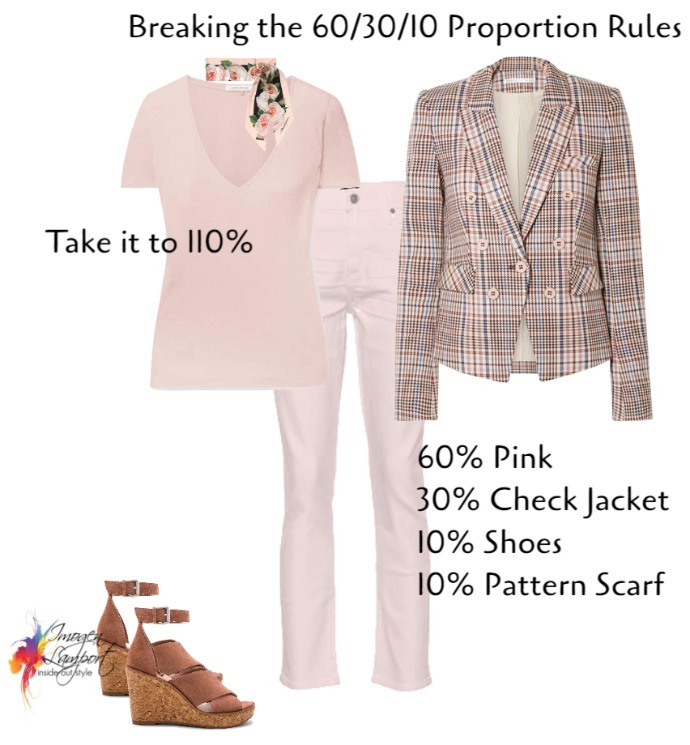 Notice that the 10% can be reflected in design elements and details – such as the gold blazer buttons and earrings in the outfit above right. Why not use this rule to include prints and patterns into your outfits? Why not make one of these proportions a “pattern” proportion rather than a “colour” element? You’ll notice that these are not exact proportions, but what you see is a dominant, subordinate and accent colour in each outfit. 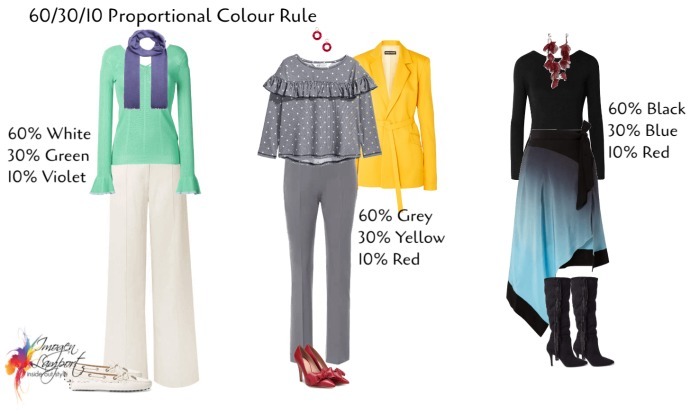 Unless the trend is for heavy colour blocking, where you end up with more even proportions between your colours (below left), instead of going down this route – even if you do have high colour contrast, why not use the 60/30/10 proportions to wear multiple colours, but in varying amounts. An easy way to do this is to find a garment in a multicoloured print or pattern (below right). 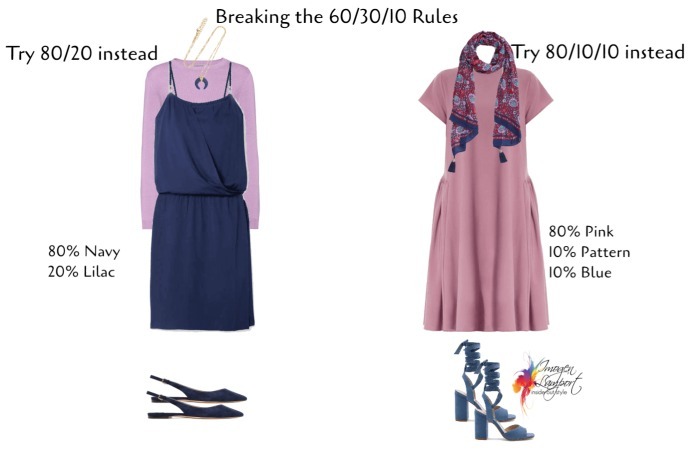 I mentioned earlier in this post about breaking the rule with regards to your ideal value being the dominant colour in the outfit – the 60 percenter. The way to get around this is to make sure you are wearing a topper in your ideal value – that way – as it’s closest to your face – it appears more dominant and obvious in the outfit. 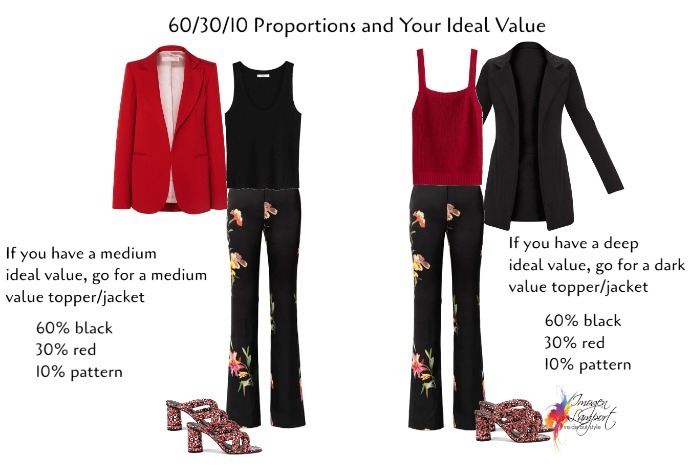 Here in this example above – the proportions are similar in both outfits – but the one on the left would be more suited to someone with a medium ideal value, whilst the one on the right would work best for someone with a deep or dark ideal value. You may wish to just wear 2 colours to create your ideal value or colour contrast. So you might choose to go with an 80/20 proportion (or even 80/10/10) instead. Alternatively, you may want to up it all to 110% (give a little extra) and add a second accent colour that is 10% of your outfit. 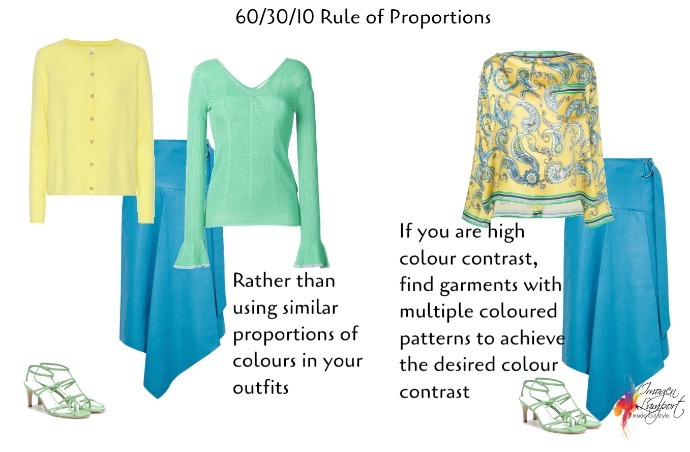 What you generally want to avoid is even proportions of colours in an outfit. 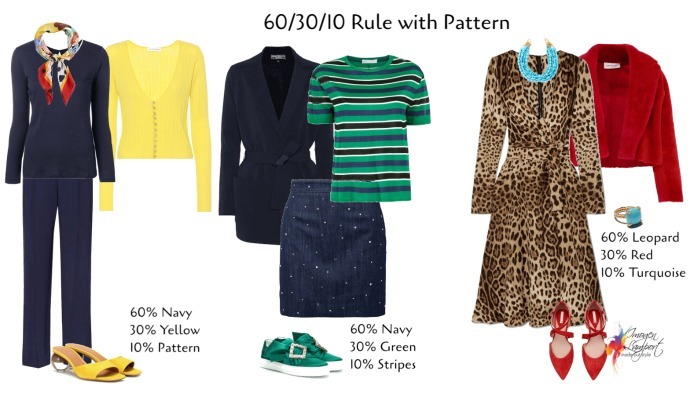 So there you have it – the 60% + 30% + 10% proportional rule, used frequently in interior decorating, now also a brilliant way to put together colours and patterns in your outfits. Wow. This is honestly so brilliant!!! Thanks so much for these tips, which I can immediately put to good use. Thanks! Glad to have helped. Imogen these rules are quite eye opening, i had never seen combinations as something with rules. I was wrong! Thank you, Imogen! After all these years of “hanging”on your every word this explanation, and visuals, will help me create a roadmap for a future small wardrobe. My husband and I are downsizing into a “very” small home and will be sharing a closet (which we have not done for 30 years). This is a difficult move for me, Imogen, but you’ve brightened my outlook about the possibility of doing more with less (and a good plan). Thanks Pat! 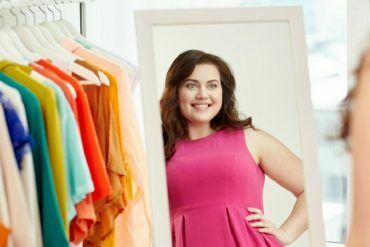 I’m glad this is helping you downsize but still create the outfits that make you shine! Although a bit off topic, there is one thing regarding combining clothes as it’s one of my favorite topics. I’m dramatic-rebel so I like wearing things like sparkles during the day. Imogen, have you ever had these type of dilemmas when combining clothes? 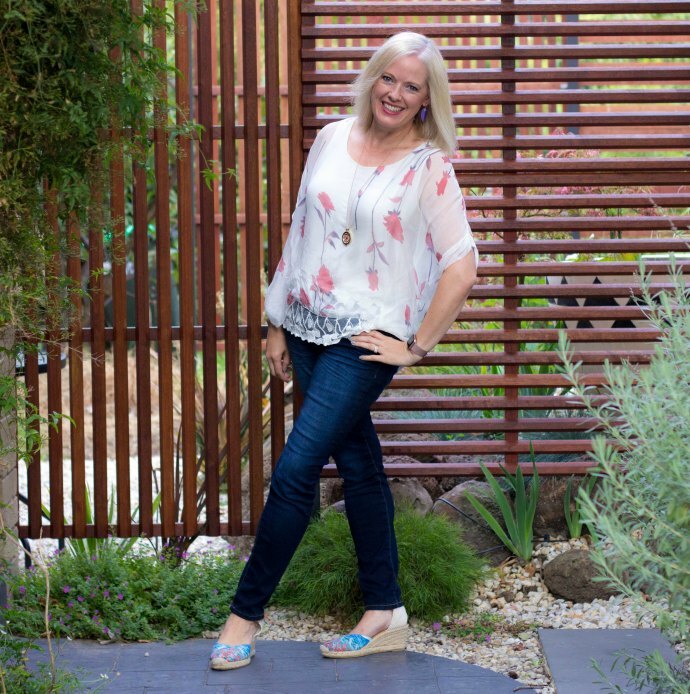 Imogen, I cannot thank you enough for your incredible work; you have transformed my look! I think you are a genius! I am slightly confused by several of the 60/30/10 outfits shown in this blog because they seem to mix cool dark neutrals with warmer and dusty colours. These colour schemes perplex me: Dark Navy, peach, teal. Dark navy, burnt umber, gold. Hmmm…….? Anyway, I love you and I love your blog. Best ever!